The Pro-Iron package is our assembled third member for performance applications nearing or exceeding 700 horsepower. The assembly features a heavy-duty, nodular-iron gear case with chromemoly caps. Pro-Iron cases are created from D-4512 nodular iron, 8% stronger than nodular iron used in OEM cases. Additional ribbing and increased material around bolt holes and bearing bores create a virtually indestructible case suitable for any performance application. Stud holes are spot-faced for even fastener-clamping force and improved sealing. Chromemoly bearing caps are designed with increased thickness for added strength and ring-gear stability. 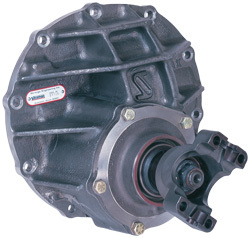 The case features a large 3.250 bore for street/strip 35-spline axles. Standard components include chromemoly yokes and forged aluminum pinion supports with 35-spline steel spool. Ring-and-pinion-gear selections range from 3.40-4.86:1 and are professionally adjusted when assembled.